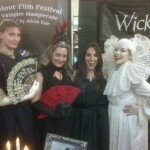 Wicked Lit at ScareLA: Fun photos and vampiresses! 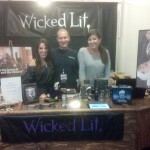 Thank you to the hundreds of fans who came to see Wicked Lit at ScareLA last weekend! We had a blast meeting you all at our booth, participating in the first ever “Theatre of Halloween” panel, and exploring all of the awesome events that will be coming to LA this October. 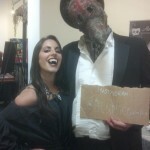 Visit www.ScareLA.com for more info about events and spooky happenings later in the year! 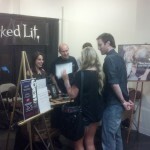 The Wicked Lit gang shows off Unbound Productions to new fans! Our booth set up – and hey, it’s resident costumer designer Christine Cover Ferro! New friends of Unbound Productions! The newest Wicked Lit supporter. 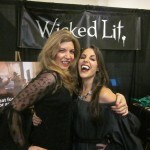 Our spicy vampiresses brought some bite to ScareLA! Paul Millet, Pamela Hill, Jeff G. Rack, and Amelia Meyers at our booth. From mausoleums to old abandoned houses, tales of Lovecraftian beasts to immersive, interactive vignettes of sheer terror, Los Angeles provides an unparalleled number of theatre companies devoted to horror. CreepyLA’s theatre editor Richard Becker leads a discussion on staged frights with Paul Millet and Jeff G. Rack from Wicked Lit, Jon Braver with Haunted Play, Zombie Joe from Zombie Joe’s Underground Theatre, and Dan Spurgeon and Drew Blakeman with the Visceral Company, as each describe their own approach towards the theatrical experience, and upcoming productions perfect for the Halloween season. Next Next post: Early Wicked Lit Photos – Sneak Peek!